Maintaining gutters and downspouts is one of the most often overlooked jobs around the house. It is also one of the most important, since clogged or leaking gutters can quickly lead to rotten fascia boards, peeling paint, or worse. While it might be tempting to do away with your gutters all together, they serve an important function in areas that receive more than 15″ to 20″ of rain a year. 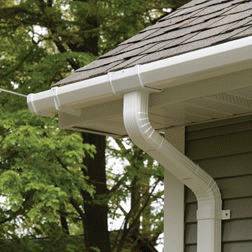 Gutters direct water away from the house to protect your siding, foundation, and landscaping. Without them, siding can rot, basements flood, and flower beds erode. To clean gutters, you’ll need a ladder, a garden trowel, bucket lined with a trash bag, a hose, a rag, and a helper. If you encounter serious clogs, you may also need a plumber’s snake. After you have removed any gutter guards, use the trowel to scoop leaves and debris from the gutter into the bucket. Add the collected material to a compost pile if you have one, or dispose of it with other lawn debris. Once the gutters have been cleaned, check the downspouts for clogs by inserting a hose with a rag wrapped around it so that water will be directed through them. Have your helper turn the water on full force, and check to make sure it is flowing freely from the end of the downspout. If a downspout has a clog that can’t be cleared with water pressure, use the plumber’s snake to break it up, then use the hose to flush out any remaining debris. As a last resort, disassemble the downspout and remove the clog. Once the downspout is running freely, start at the far end of the run and rinse the gutter thoroughly with the hose. After they are clean, inspect and repair the gutters and downspouts as necessary. Make sure all hangers are securely fastened, and use a carpenter’s level to check that the gutters have the proper slope and are not holding water. They should slant down toward the downspouts about 1/4″ every 10′. If a section sags, snap a chalk line on the fascia, and remove the hangers in the area. Measuring from the chalk line, lift the gutter up and reposition the hangers to hold it in place. Water is heavy, and gutters should have a hanger every 2′ as well as within 1′ of any seams. Now that your gutters are secure and have the correct slope, check them for leaks by running water through them with a hose. Mark any leaks and allow the gutter to dry out thoroughly before patching them with gutter sealant. Caulking or roofing cement can also be used, and specially formulated self-sticking patches are available to cover damaged areas. If sealing a joint in the gutter or downspout doesn’t stop the leak, disassemble the joint if possible, clean the two parts, and put them back together using sealant. Now that your gutters are in tip top shape, check them from time to time while it is raining. If water is spilling over the edges or not running freely from the downspouts, make a note to clean them again as soon as possible. This entry was posted on Friday, August 17th, 2012	at 1:48 pm	. You can follow any responses to this entry through the RSS 2.0	feed. Both comments and pings are currently closed.